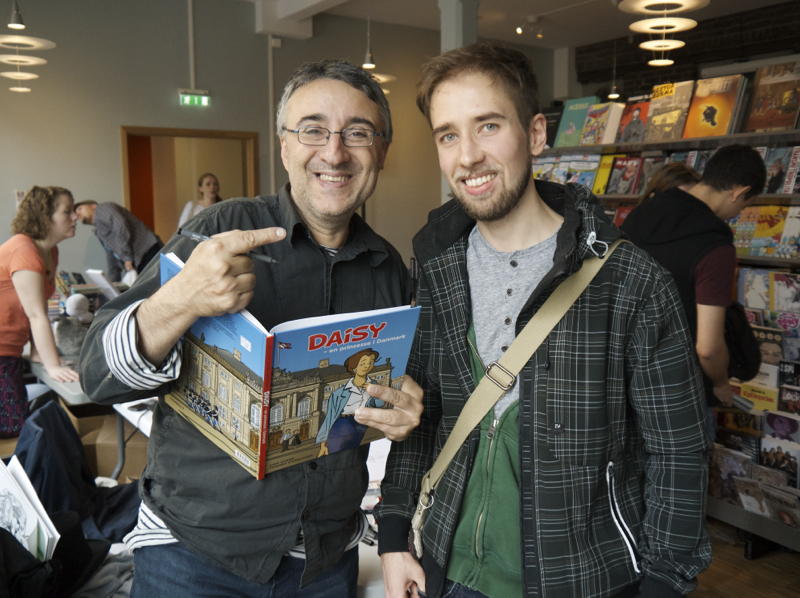 My «report» from Raptus – Bergen International Comics Festival 2014. (read part 1 here). Another day, another stack of comics. The haul I brought home today was a bit heavier than yesterday’s, and I don’t dare to think about the amount of money I spent. I can’t complain though, as I got to meet and get books signed by both Lene Ask and Thierry Capezzone. Here’s the latter, pictured together with yours truly. As a side note, Capezzone was very friendly and interesting to chat with. He asked me about what I do for a living, and he even gave me some drawing tips when I told him that I dabble in comics. What a great guy! (Also, thank you to the Outland employee who took the photo). I also completed my set of «Dadaph Serraph» comic books made by Bård Lilleøien, and I bought an anthology from Überpress called «Überwestern». I look forward to reading them all soon. 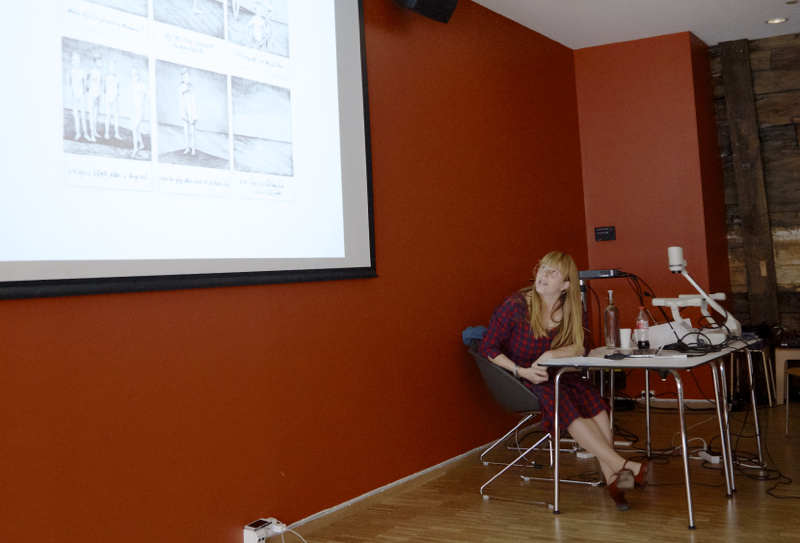 One of the things I attended today was Lene Ask’s presentation about her new book called «Kjære Richard». The story takes place in the late 19th century, as a young boy is left to live in Norway while his father leaves to work as a missionary in Madagascar . Ask tells the story through a real correspondence of letters between father and son. The collection of old letters she has used exists today in an archive in Stavanger, a city which Ask during her presentation called «the missionary capital of Norway». She also read excerpts from the book with great feeling. 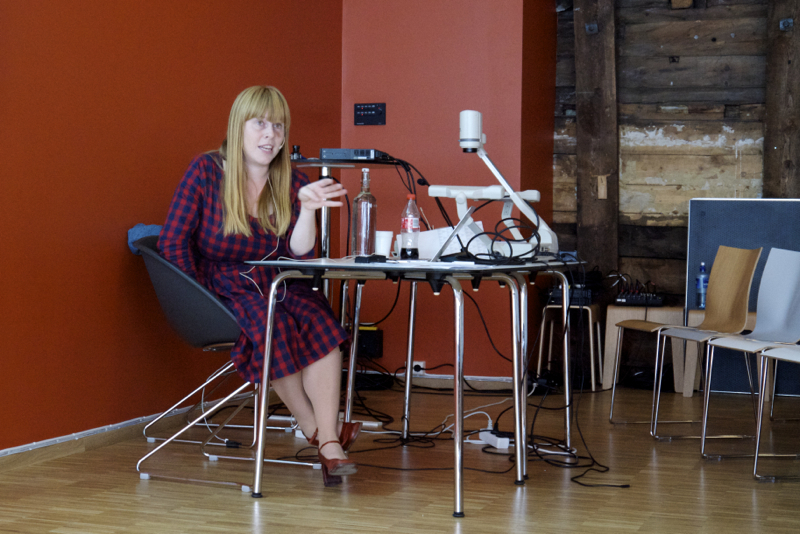 Later in the afternoon, I went to a panel discussion about comics as documentaries. I had been looking forward to hearing about the topic, and I was hoping for a large turn up. Sadly, there were only 7-8 people in the audience. However, I don’t think the low attendance affected the quality of the discussion. 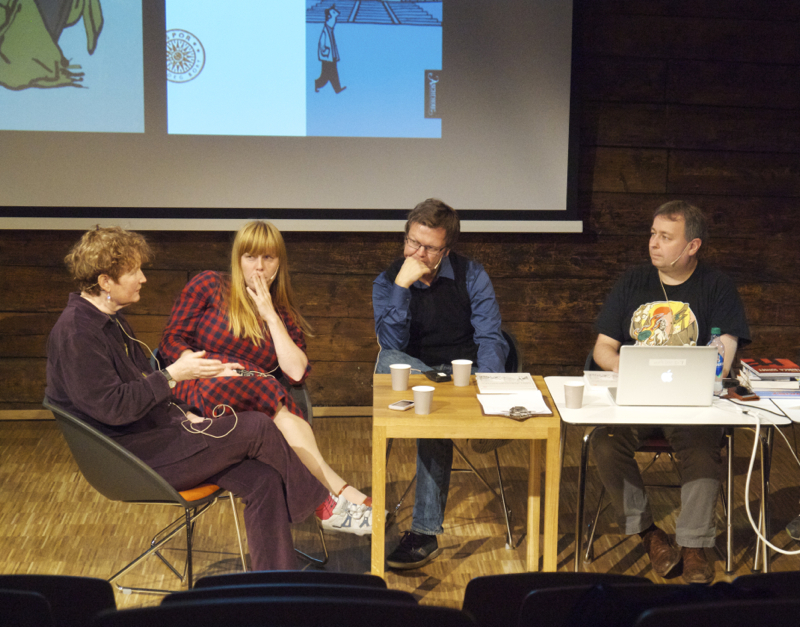 Expert moderator Kristian Hellesund (right) had (from left) Ingebjørg Jensen, Lene Ask and Øystein Vågnes on stage, and they talked at length about autobiographical comics and the journalistic quality of documentary comics. Last, but not least, was the big show, which also marked the end of the festival. 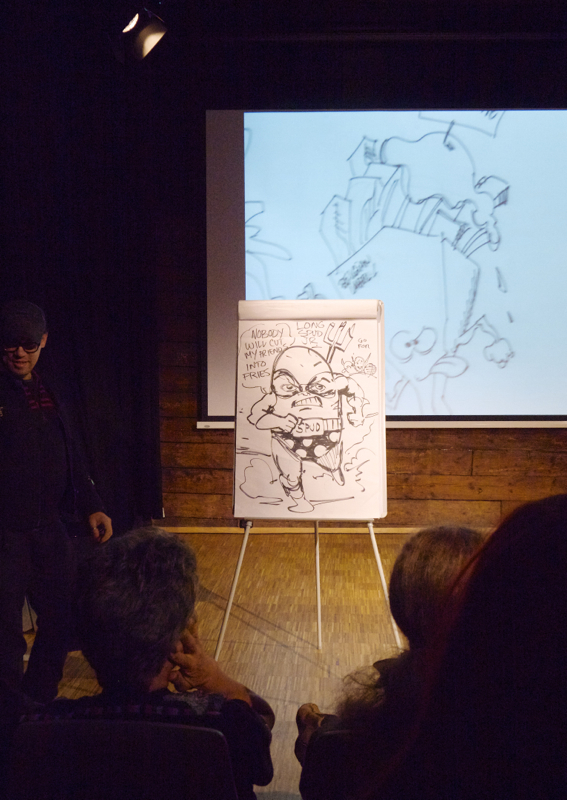 The remaining audience could witness drawing battles between some of the guests. They drew live on stage, using suggestions from the audience for superhero/sidekick combos. I think the people in the audience must’ve been kind of hungry, because there were suggestions like «Potato Man», «French Fries» and «Banana Woman». There was also «Apple Woman», which Mike Collins redubbed «Apple-Lass» and drew a spoof of the infamous Spiderwoman cover by Milos Manara. That’s it for this year. Next year will be the festival’s 20th anniversary. The dates are already set; Raptus 2015 will be held on September 18th to 20th. Raptus.no should also update soon, so be sure to check it out. This entry was posted in Blogposts and tagged comics festival, discussion panel, festival, Raptus by Jostein. Bookmark the permalink.